Want to use about 300-500 yds of handspun or mixed bulky yarns? This is the Cardigan for you! Based on the easy “Boho Cardi” by Carol Porter, the pattern has been adapted to handspun with additions of lock spun for cuffs and collar. Feel free to build up the collar with lots of different yarns for added warmth/drama. NOTE: Handspun is heavy! The dimensions in the cardigan are approximate, and will assume a stretch of about 6 inches. Try your intended yarn by making a swatch, and hanging it from a rack/hanger. Measure the length before and after ‘stretching’ to see how much length you will gain and adjust the pattern accordingly! This is merely a simple ‘recipe’ to make a cardigan---use your imagination and creativity to make it your own! Length varies—knit 20 inches, stretched to 26 in example. Do a swatch to see YOUR stretch! Gauge: 2 Stitches/inch using size 36 , 32 inch circular needles. Length - approximately 1 stitch per inch. Approximately 350 yds of chunky/bulky handspun or a mixture of yarns. 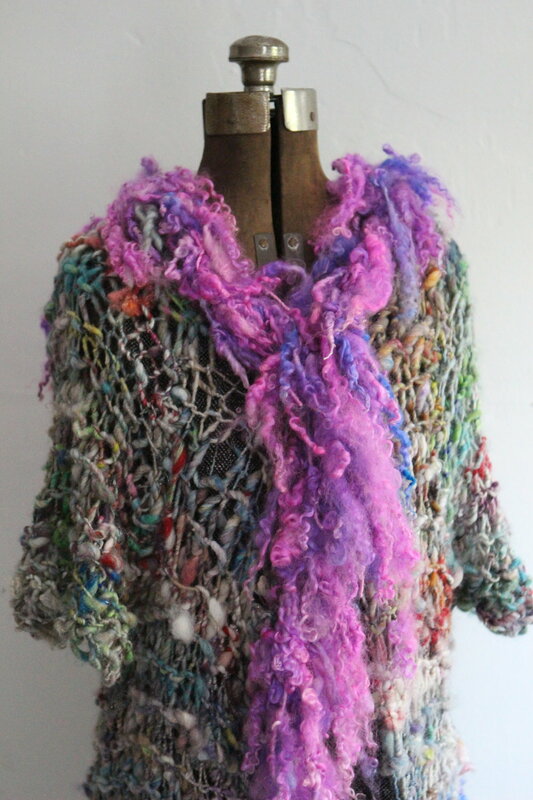 In the example, I didn’t weave in ends, I connected the yarns together with hand dyed silk ribbon, to give it an organic look (handspun had bits of things sticking out so this added to the texture and appearance). Size 36 or 50 circular needles, 32 inches around, plus extra needle for Three Needle Bind off at the shoulders (can seam together, but bind off assures a better shoulder join). Size P/Q crochet hook: for attaching lock yarn or other textured yarns for hems and collar. The sweater construction is as follows (from the bottom up): Start knitting the back of the cardigan, bind off for the neck. Knit the first front panel from live stitches (Right front, as worn). Then attach yarn to back neck and knit up to match the shoulder area of first panel. Then pick up and knit the second panel (Left front, as worn). Stitch fronts to back using the three needle bind off technique. Make sleeves, then attach by setting them in starting at the top shoulder and going down. Seam together the sleeve bottom. Crochet lock yarn to edges if desired. Knit across the remaining stitches on the needle (8(9,11,12). Knit across these stitches again (2 rows plain garter stitch). Bind off 1 stitch at the beginning of this row (armhole edge), then knit across the remaining stitches 7(8,10,11). Work even until piece measures 12 inches. At neck edge (opposite of armhole edge), bind off one stitch every other row 5(6,7,7) times. Work even until piece measures about 17-20 inches (where your stretchy gauge swatch comes in---add the stretch to this to get total. In picture, large sweater knit 20 inches and has stretched to 26 inches). Put remaining stitches on a holder (should have 2(2,3,4) stitches) for three needle bind off to shoulder stitches from sweater back. Join yarn at the armhole edge that is next to the completed front section. Bind off one stitch at the beginning of the next 2 rows -14(17,18,21) stitches. Work even until the piece measures about 16-17 inches from cast on edge. Knit 2(2,3,4),bind off next 10(13,12,13) stitches, knit across 2(2,3,4) stitches. Work even until piece measures approximately 20 inches. Put remaining 2(2,3,4) stitches on a holder to work the three needle bind off to the Left Front Side. Beginning at armhole edge, bind off one stitch and knit across. Work even until piece measures 12 inches. At neck edge, bind off one stitch every other row 5(6,7,7) times. Work even until piece measures about 17-20 inches-match right front side length. Put remaining stitches on a holder for three needle bind off to back. Cast on 13(15,15,17) stitches. Knit every row for 6-7 inches (for ¾ length sleeves; go 12-14 inches for longer sleeves, include your stretch measurement). Bind off 2 stitches at the beginning of the next two rows 9(,11,11,13). Knit two rows. Bind off one stitch at the beginning of the next 6(4,4,4) rows until 3(7,7,9) stitches remain. Bind off 0(2,2,3) stitches at the beginning of the next two rows, then bind off the remaining 3 stitches. This is the top of the sleeve cap. Using three needle bind off, attach front panels to shoulders. Set in sleeves using a smooth, worsted weight yarn and any stitching you would like (decorative, hidden stitches, etc). Since this sweater carries a lot of weight, make sure the stitching secure. Crochet lock spun yarns onto edges for a fun look, and use extra around the neck and fronts to build up the area. Wear and enjoy!